How to Choose a Local Roofing Contractor – Why Eastbrook? Nothing is worse than having a roof that leaks. Not only does it cause severe aggravation, it creates damage to other parts of your home. Whether it was due to poor workmanship or from harsh weather, the fact still remains that you’re going to have to call in a roofing contractor…and fast. When it comes to looking for the right local roofing contractor, there are a lot of factors that one should take into consideration. How can I find a local roofing contractor? Does the contractor have insurance? How much are they going to charge? The list goes on and on. Hopefully, the following tips will help your selection process become a tad bit easier. Experience: It’s one thing to hire a roofing contractor, but it’s another thing to hire a roofing contractor with experience. Having experience is such an important quality because it cannot be bought–it has to be learned. The more experience a contractor has, the better the performance. 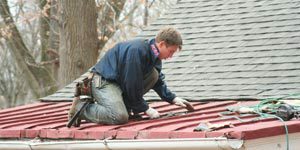 Insurance: Be sure that your local roofing contractor is insured. The worst thing one can do is allow for their roofing contractor to take the fall and leave you liable for their injuries. Before you make any sudden decisions, ask your contractor for a certification that shows that they are insured. If you want to take an extra step (just to be super safe), you can call and verify with their carrier to make sure that they are indeed insured. Reviews/References: Most consumers look at reviews prior to buying something or highering a service. Online reviews are a benchmark and can be helpful. However, a direct reference to someone that has gotten their roof done by the contractor is even better. You may even have the opportunity to drive by and see their work. Free Estimates: Free estimates are very important because it notifies you of what you’re going to need before paying for the services. A lot of contractors offer free estimates, so receiving a quote will help you choose which local roofing contractor is best for the job. Repair Warranty: Make sure to check to see if the work is warranted. A good contractor is very proud of their work and will always have the warranty to back it up. When it comes to roofing, you have many choices. No matter the dimensional, structural or architectural look, Eastbrook has got you covered. Being in business for over 20 years now, we have the experience that you’re looking for. We also offer free quotes, so that you’re able to decide before committing. From repairs to restoration, we can give you the roof that want and need. Contact us today and make us your new local roofing contractor.